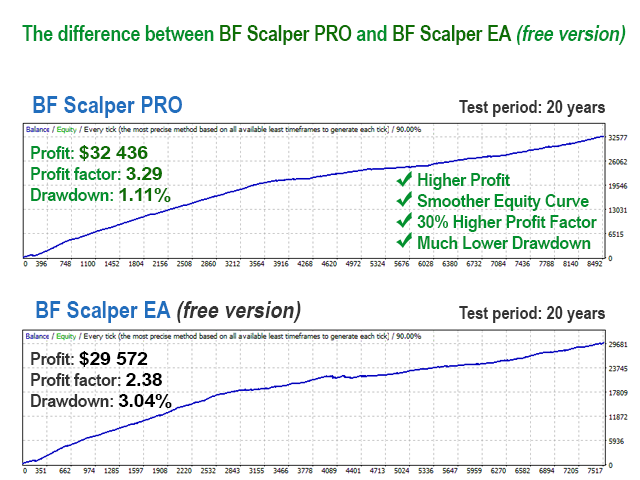 BF Scalper PRO is the professional version of my very popular free EA - BF Scalper EA. I have implemented a lot of new additional features and systems in this PRO version in order to improve its overall performance. The improved exit logic reduces the drawdown and increases the efficiency of the system. 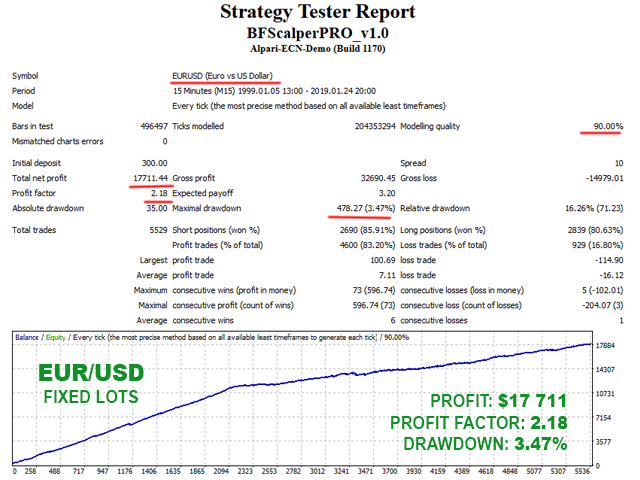 In addition, the new ATR based Stop Loss calculating algorithm /as an option/ works excellent adapting the Stop Loss levels to the current market volatility, decreasing the drawdown and increasing the Profit Factor of the system. 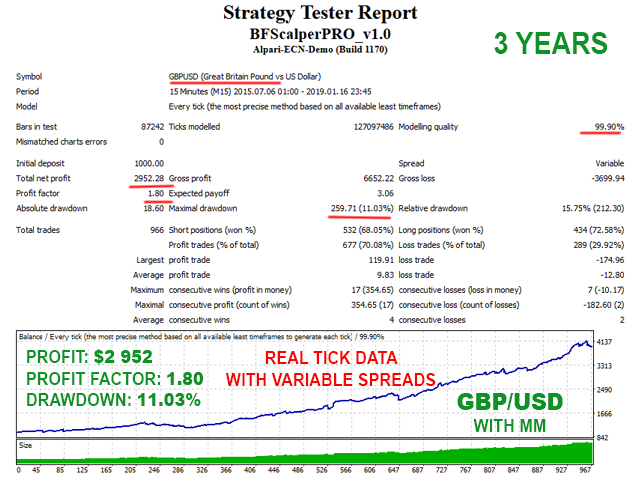 In order to prove that the system is profitable under real market condition, I’ve performed 99.9% quality, real tick data, REAL SPREAD backtest, which are promising. Supported currency pairs: GBPUSD, EURUSD, EURCHF, EURAUD, EURCAD, GBPCAD, USDCAD, USDCHF and USDJPY. The default settings are for GBPUSD. I have prepared set files for other supported pairs too. Since I cannot include them here, please contact me, and I will send you the set files. Please, make sure that you have loaded the set files for each individual currency pair! 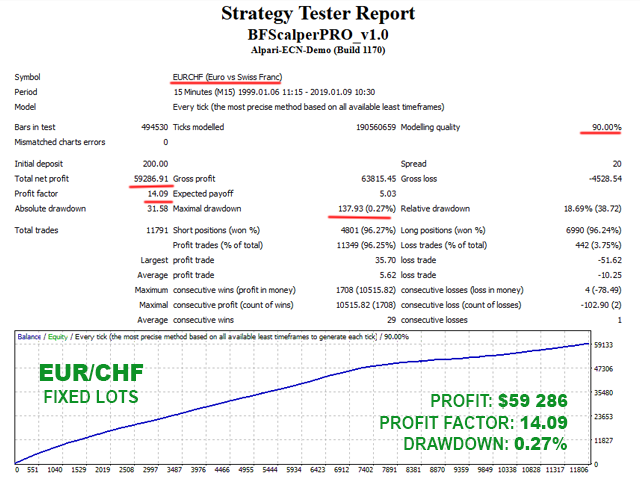 Please, bear in mind that the performance of this kind of trading is highly limited by the brokers conditions - do not even think to try it on random brokers, or micro accounts - only on well-known ECN brokers with tight spreads. BF Scalper PRO is equipped with Advanced News Filter. Thanks to this filter you can avoid trading during most important news and events. The news filter can increase the profit factor of the system and reduce the drawdown. It is disabled by default and you can configure it precisely. With the Time Management System you can precisely configure the robot to trade only during specific hours. You can also configure the robot to trade or not on individual week days. This is a very powerful option which will let you avoid the most dangerous periods and to trade the best periods when the robot show best results. We all know that sometimes it could be risky to trade on Friday because the trades may remain during the weekend and may be closed on big loss due to Monday gaps. BF Scalper PRO has a Friday Exit system and you can configure the robot to close all trades on Friday evening at a desired time and to stop trading after this time. 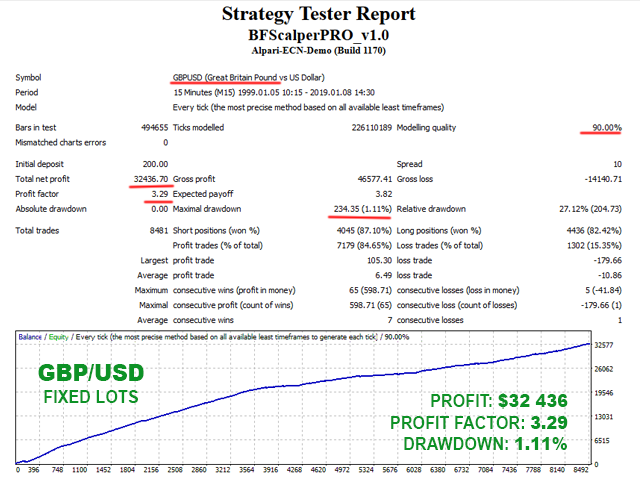 BF Scalper PRO can send email and push notifications to your mobile phone and inform you about its trades. You can enable Email and Push notifications from BF Scalper PRO settings. 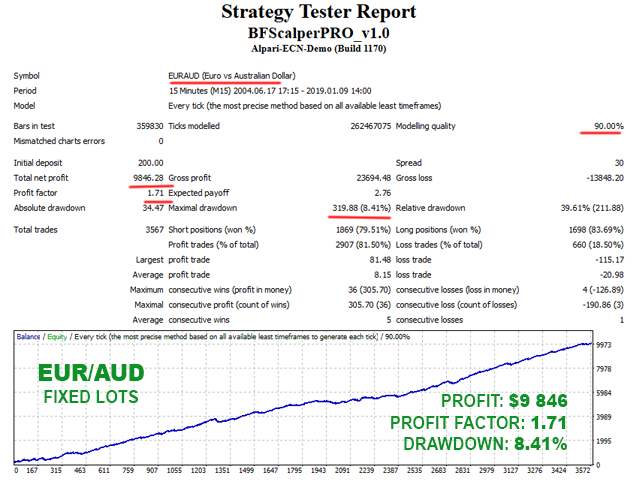 BF Scalper PRO comes with a new ATR based Stop Loss calculating algorithm /as an option/ works excellent adapting the Stop Loss levels to the current market volatility, decreasing the drawdown and increasing the Profit Factor of the system.